Thanks to the Claddagh Ring, the name Claddagh is known the world over. Named after the small fishing village in Galway, the history of Claddagh is a fascinating one. 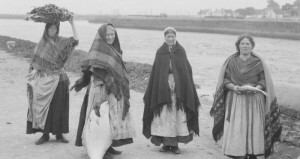 The claddagh people dressed similar to country women at that time with bright petticoats, cloaks, and heavy shawls. They also had distinct dark hair and skin, compared to their fairer neighbours. The men from Claddagh were predominantly fishermen and fished on traditional boats known as Galway hookers. These boats have become a symbol of Galway with their distinct maroon sails. 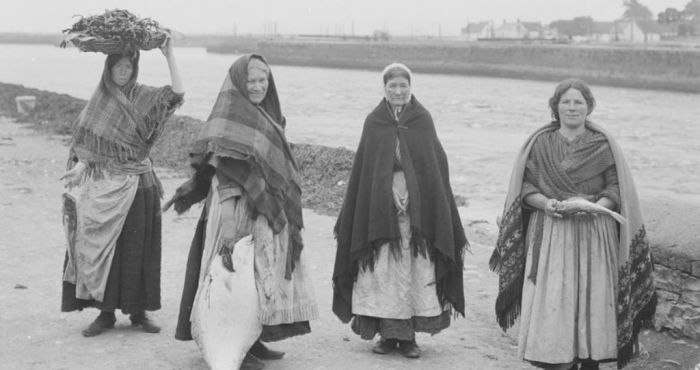 The women would then sell their catch at the fish market, located in the Spanish Arch. The women were also great crafts people, making nets and lace. Sadly, the old Claddagh village as it was known came to an end. Fishing trawlers saw the end of the local fishing trade and many fishermen left in search of a better life. Many joined the British Navy and perished in WW1. 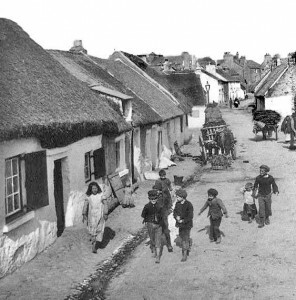 The last of the traditional Claddagh cottages were demolished in the 30’s after a deadly outbreak of tuberculosis. The cottages were deemed unsanitary and demolished, soon to be replaced by council houses by the dismay of Claddagh people. Very little remains of the original village, and yet, it’s culture and influence remain strong. The rising popularity of the Claddagh Ring has sparked interest in the history of the village in recent times, and for good reason. This unique village was something truly special and is deserving of reminiscence and celebration.